NCA is a tireless advocate for increased access to Newtown Creek. With 11 miles of shoreline, Newtown Creek has limited places where local neighbors and employees can safely get to, let along see the waterway. In addition to connecting the community with the Creek and providing public space, access points can provide additionally important and underserved needs such as wildlife habitat, stormwater management and green space to combat urban heat island effect. Since NCA’s beginnings in 2002, we have endeavored to expand safe access to Newtown Creek and have helped realize several Creek-side open spaces including the Newtown Creek Nature Walk at the end of Paidge Ave. and the Manhattan Ave. kayak launch. Although the Nature Walk and Manhattan Ave Street End are the only two official access points (as of 2016), NCA continues with efforts to transform other city-owned street-end areas from spaces of neglect, overgrowth and dumping into inviting access points. This includes hands-on efforts, like those seen at Plank Road , as well as in-depth planning efforts with multiple agencies and stakeholders, as currently being pursued with North Henry Street. There are nearly a dozen of additional street-end areas which hold potential for public access and redesign (as shown on the NCA Map of Newtown Creek). Advocacy for these open spaces began through member organizations like Newtown Creek Monitoring Committee and Barge Park Pals. Below is a little history lesson fromNCA board member Laura Hofmann on how the two existing access points came about. The ideas for the Nature Walk were already in place when I became a member, well over a decade ago. Since that time, NCMC members and liaisons have come and gone. Barge Park Pals learned about the NCMC because of the odors that were coming from the sludge tank, DEP damaging the underground pipes that led to the demolition of our parkhouse, and rumors that the committee was trying to “take over” the park. I was astonished to learn from committee members (such as Barbara Mihelic, Carol Woodward and Tony Snackus ‘deceased’) how close I actually lived to the Creek. I had no idea that I was THAT close. I was also astonished to learn that the park was so close to sewage. Not only did committee members aim to “reveal” the Newtown Creek, as the NCA website uses the word. But the committee was aiming to fling the covers off of the waterway. Committee members were separately working in groups such as the Concerned Citizens of Greenpoint, Greenpoint Video Project & WaterWays & Greenviews, to rid the Greenpoint waterfront of environmental offenders and to punch their way to the shore. Irene Klemontowicz was already a waterfront icon. I viewed her as the ultimate Creek historian and advocate. She either attended or knew about everything that went on regarding the oil spill, the sewage treatment facility, and the Creek in general. I believe that her passion seeded many of these groups. I remember former NCMC liaison Bob Gormley saying that we needed to “barge our way” to the Newtown Creek shore. And we did. A few events then come to mind. The first was a major cleanup of the Manhattan Ave St. End. The footings of the bridge were still there. There was HUGE debris there as well as along the shore near Allocco. The NCMC members (all wearing other hats) got together and arranged for the DOS to help move the debris. Barbara tossed baby rats into the creek by hand, seagulls swooping down to eat em. What seemed like tree roots were actually strings of rubber tires that we yanked from the ground to make way for some greenery growth. At another major cleanup we were joined by AmeriCorps and the East River Crew, who climbed down to the shore of Whale Creek and removed large debris from vehicles, as well as empty containers of unknown chemicals. They passed huge debris up from the waterfront from one person to another. A human conveyer belt. George Trackus actually built a make shift dock at the Manhattan Ave St. End. with his own hands. 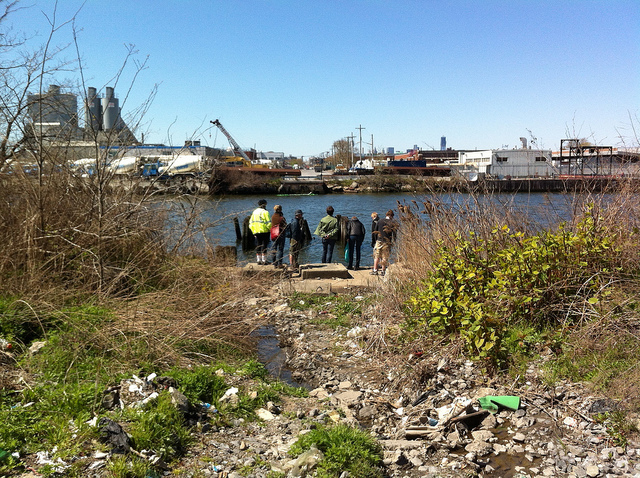 He was determined to make the Newtown Creek a viable host for the Nature Walk. At a time when the Creek was at its worst, people literally risked their lives to hold waterfront cleanups and get to the shore. It was done, so DEP could no longer tell us what was or wasn’t possible. The community proved to officials just how much could be done with so little. No excuses. It’s that kind of determination that existed and still exist amongst the NCMC and other NC advocates. Newtown Creek Alliance is at Kingsland Wildflowers. Open hours at @kingslandwildflowers - today and tomorrow! Come see the green roofs coming back to life. Free and open to all. Stop in and sign hi! Tomorrow night, check out film screening and panel discussion at National Sawdust with NCA's Director of Advocacy and Education Lisa Bloodgood. Newtown Creek Alliance is at Waste Management Phoenix Open Clubhouse. The English Kills Living Dock is providing a home for wildlife in unanticipated ways. In the past few weeks a pair of expecting geese colonized one of our spartina grass crates and laid 5 eggs! We were planning to install goose fencing this month, to prevent geese from eating the new grasses as they typically do in May and June, but will wait until this new family has checked out of the delivery room. Newtown Creek Alliance is at PS 110 The Monitor School. Overseen by @nysdec this is a cleanup of contaminated soil by @exxonmobil near Greenpoint Avenue Bridge. There are high levels of PCBs on site - unrelated to the Greenpoint Oil Spill which impacts surrounding groundwater.